The recent furore with one of the maths GCSE papers raised some interesting points. The solution is within the ability of an A* student but the topic, probability, should be one that even average students would attempt. By combining the creation of a quadratic equation with probability, only the very best students are likely to have obtained the correct answer. To really understand why the level of anger directed at edexcel, the exam board, was so high, it is important to know the grade boundaries for this exam. In June 2014, a score of just 26% resulted in a passing C grade, with 44% being enough for a B grade and 62% for an A grade. Even an A* only required a mark of 80%. With an average student obtaining less than half marks, it is hardly surprising that this question went viral on twitter. What is really concerning is that questions like this may well become the norm in two years’ time. The Department of Education’s “Mathematics: GCSE subject content and assessment objectives” document, released in 2013, outlined the changes that must be made to the GCSE maths syllabus for students being examined from June 2017 onwards. It is the sample exam papers created by three of the exam boards that have come under fire recently for being too difficult. The Office for Qualifications and Examinations Regulation (Ofqual) stated that while the higher papers would stretch the most able students, “OCR, Pearson and WJEC Eduqas need to refine their higher and foundation tier papers to sufficiently differentiate across student abilities.” In other words, the proposed exams are too difficult for the average student. As part of its conclusion, Ofqual also stated that the boards’ higher papers “compare well with papers from a range of already high-performing countries.” Which countries is it referring to? Top of the list in the Programme for International Assessment (Pisa) results from 2012 were Shanghai-China, Singapore, Hong Kong-China, Taiwan, Korea, Macau-China and Japan. Where was the UK? Down in 26th for maths. Given this, it might be seen as being fair to aspire to the levels of some countries in the Far East. But is this reasonable? How do the educational cultures compare? Take a look at education in Singapore. Figures published in 2005 showed that 63 per cent of those aged over 15 who were no longer students had achieved nothing better than a primary school education. What steps has Singapore taken to improve this situation? Around a quarter of all public spending goes on education, more than double that of the UK. Training drives for new staff have resulted in many classes having two teachers, and all new staff receive continuous personal training and development from senior teachers. In English primary schools, teachers only need a C grade at GCSE to teach maths; in Japan, most teachers at the same level have a maths degree. Making exams more difficult will not raise the quality of secondary education in the UK. Proper investment in specialist teachers in primary school and better qualified teachers in secondary schools would be a start. And when a quarter of all UK secondary school maths teachers do not have a maths degree, is it any wonder that our students are poorly taught and ill-prepared for their maths exams? Online maths sites: expedient or lazy? When I started teaching, classrooms still contained blackboards and chalk and the personal computer hadn’t been invented. When I stopped some 10 years later, technology had stretched to whiteboards, wipeable markers and the BBC B. On returning to teaching as a private maths tutor I spent a day in a local secondary school to see how technology was being used. Interactive whiteboards and their linking with in-class computers makes the teaching environment a lot better than in the late 1970s. Lesson preparation is much easier – no more creating purple Banda masters and duplicating using a mixture of isopropanol and methanol, though the smell was quite enticing! If there is one part of technology that has made a really big difference it has to be the internet and online teaching resources. Sites like BBC’s GCSE Bitesize are brilliant for students while tried-&-tested lessons from the likes of the TES (Times Educational Supplement) site can save hours in planning. On the homework front, a number of websites offer comprehensive packages to which many schools subscribe. A good example is MyMaths (www.mymaths.co.uk). For less than £600 per year a secondary school gets a huge interactive resource covering National Curriculum level 2 through to A-level. Unlimited access for all students and teachers, online homework tasks, an assessment manager and booster packs are just some of the advantages. So what could be wrong with the scenario of personalised homework for all students? From the teacher’s perspective, not much. Cuts down on setting homework, taking in exercise books and handling marking. But there is a huge downside. Anyone who has marked GCSE papers or worked with the marking schemes that are made available will appreciate that most marks are given for showing the correct methods and working out. In fact it’s possible to get a grade A without having a single correct answer! How? 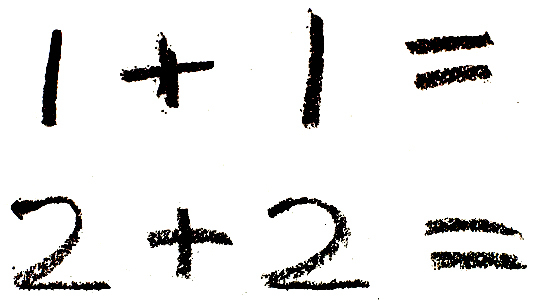 If small mistakes are made, the answer would be wrong (which usually loses one mark) but all method and working out marks would be obtained – and that’s the lion’s share of the marks. How do you show method and working out with online resources such as MyMaths? You can’t. So how do students get used to showing methods and working out? They don’t. Technology is a brilliant helper but the problems start once you become a slave to it. MyMaths has its place in maths teaching but from what I’ve seen, too many teachers are using it instead of setting proper homework. This might be expedient and provide a short-term answer but until GCSE exams are taken online too, such a lazy approach will adversely affect students’ grades – especially those on the margins of passing. A GCSE grade C is a pass – or is it? As someone who taught maths for 10 years in the 1980s and has recently come back to maths tutoring, a look at the syllabus from Edexcel, the main examining board, shows that little has changed. Most of my years 10 and 11 students are studying for Edexcel GCSE with a few sitting for the IGCSE version. IGCSE? That’s International GCSE. Available in more than 100 countries, it doesn’t have to adhere to the national curriculum. For example, there is no compulsory study of Shakespeare in English. Perhaps this is part of the reason why in 2006 the Qualifications and Curriculum Authority, which assesses the strength of various qualifications, deemed that IGCSE was “not suitable for assessing what pupils in England learn.” State school pupils do not sit IGCSE exams because the government has not approved them for state school funding. The real value for IGCSE in maths is that it prepares brighter students for their AS-level studies by including extra topics such as calculus, set theory and functions. Sounds reasonable – until you realise that a local non-state school will only allow students to take the higher level of IGCSE maths with grades from A* down to E. The easier foundation level, with grades from C to G, is not offered. One of my students at this school mentioned the higher level pass mark for a grade C. I thought they had made a mistake. When a second pupil made a similar comment and that their teacher had quoted this figure, I decided to investigate. So, what do you need for a grade C? Twenty-four per cent. Yes, you read correctly – 24%. In any other walk of life such a figure would be viewed as an abject failure but not, it appears, for Edexcel’s maths IGCSE. It’s easy to confirm this as all subject boundary marks are freely available on Edexcel’s website. Just 42% obtains a grade B, 61% a grade A and 80% a grade A*. More scary, a grade D, viewed as barely a fail, can be obtained with just 12%! Thinking that this might be an IGCSE issue, I also checked the standard GCSE maths grade boundaries. Over the past five years, the highest mark required for a grade C at higher level was 28%; last November a student would only have needed 23%. The anomaly appears to be confined almost solely to maths GCSE. On checking with Edexcel I was informed that the low mark was due to the discontinuation of the modular exam. As this had been taken at three sittings and the current exam is at one sitting, the lower mark boundaries reflected this and is unlikely to change in the near future. The real question is: why are schools forcing weak pupils to sit higher level not foundation level? There’s only one answer: to maintain academic results. It’s easier to get 24% at higher level than the 67-70% required for a grade C at foundation level. Does it benefit the students? Certainly not. It’s questionable whether 24% shows even a basic level of numeracy.